The developer hopes to rezone an L-shaped space — encompassing parts of Evergreen Avenue, Melrose Street, and Bushwick Avenue — currently designated for manufacturing use. The project will feature 977 new residential units, shops on the ground floors of most of the buildings, and four community green spaces. It would also reinstate abandoned sections of Stanwix Street and Noll Street that have not been officially mapped since the 1930s, allowing for more street parking in the area. At last night’s Community Board 4 meeting, a team of lawyers and representatives from Read Property showed off the renderings above and presented their finely tuned plan, which has been in the works for nearly four years and seemed specifically tailored to smooth over potential protests from residents before they could even think them up. 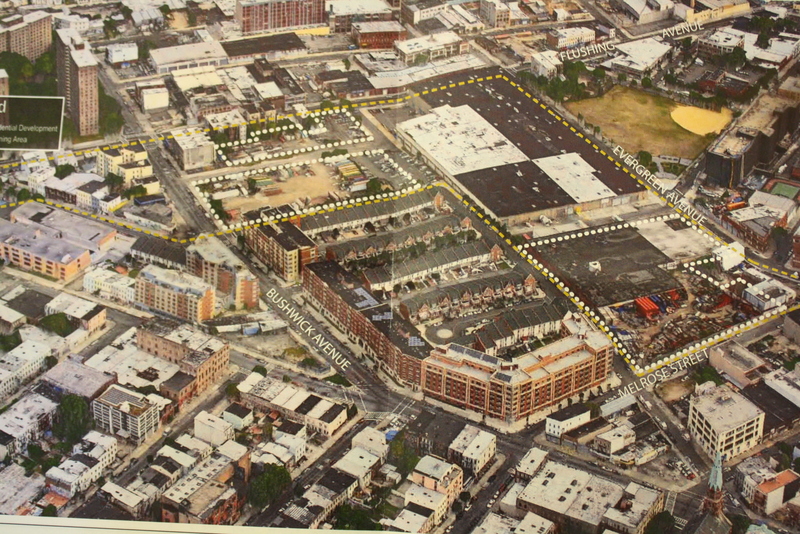 Outline of proposed construction site. 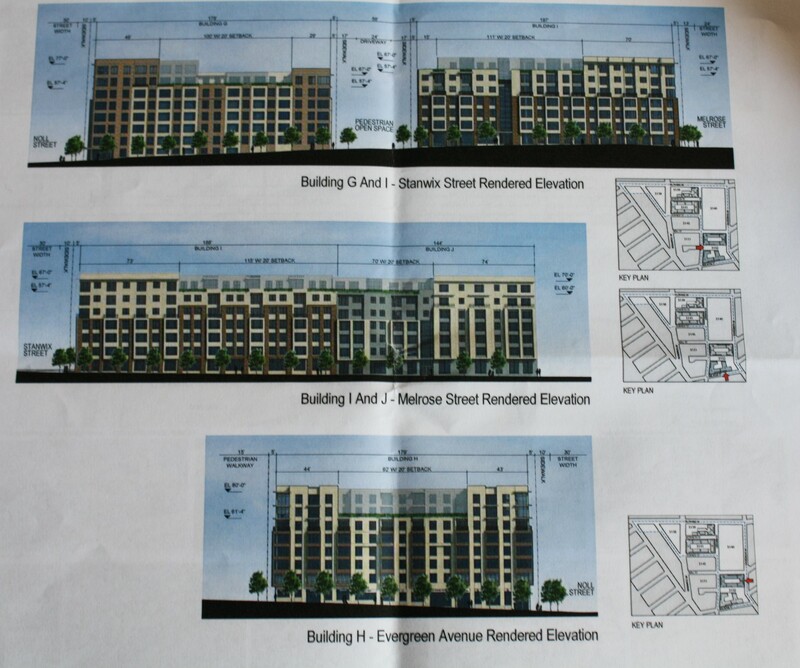 The proposed construction sites are all on vacant lots, so no area residents would be displaced, and none of the new buildings would exceed 80 feet in height. Read Property is also working with the School Construction Authority to expand PS-145 and alleviate school crowding, which is already a problem in the area and might be exacerbated by the new residents that another development would bring. 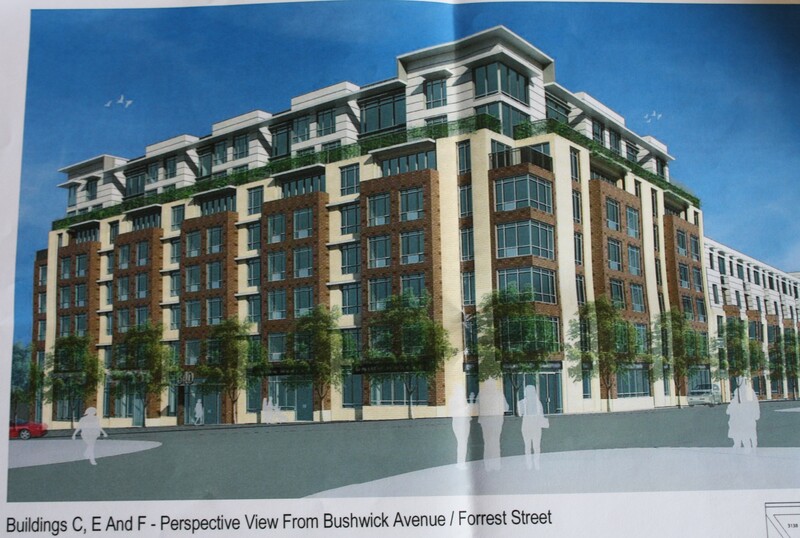 The area, near the Myrtle Avenue stop on the J and M, has already been altered over the past few years by a string of apartment complexes along Bushwick Avenue called Rheingold Gardens. Twenty-four percent of these latest units would be officially “inclusionary” in that they would be priced at 60 percent of the median area income, which is currently between $36,000 and $53,000 per year, according to Read Property. A studio would have a monthly rent of $830 to $900, while a one bedroom would go for $890 to $967. The remaining 76 percent of the units have yet to be priced. 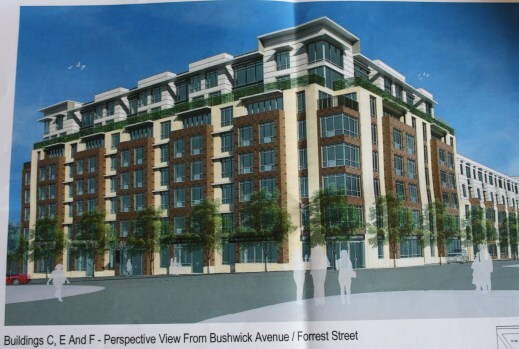 Community Board 4 decided not to vote on the proposal until they have met with a planner to ensure they fully understand all of its potential repercussions. 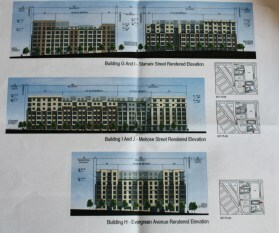 If the plan is approved by the city, the lots would be under construction through 2016.